Home Edu News It is healthier to be a pear than an apple! It is healthier to be a pear than an apple! Fat accumulation is a modern phenomenon. For women, it usually accumulates around the hips, resulting in a pear-shaped look. In men, fat tends to build up around the abdomen, creating an apple shape. 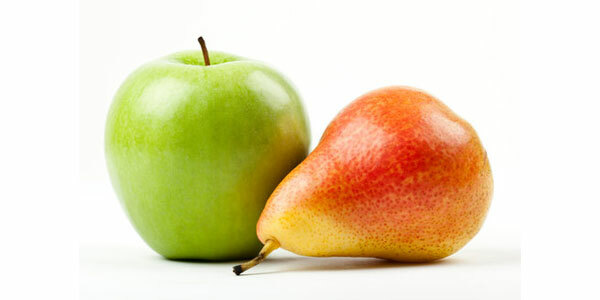 Researchers have shown that it is healthier to be a pear than an apple! The study appears in the journal Frontiers in Immunology. The research has shown that only male mice experienced neuroinflammation, or activation of the immune system's response in the brain, after being fed a high-fat diet. Male mice also showed low testosterone and reduced sperm count. Females were left unaffected. Researchers sees the likelihood that these inferences will be similarly applicable to humans too. It is also observed that female women and mice deposit fat differently than their male counterparts. Females deposit fat subcutaneously, right below the skin, while males accumulate fat deeper, in the body's visceral region, which may affect internal organs. However, eventually, even in women, the subcutaneous regions get overwhelmed with fat and the abdominal region begins to show obesity, which leads to neuroinflammation. We associate food with happiness, social interactions, and family gatherings. Still the researchers would advice: 'Watch your diet! And keep an eye on body weight, particularly around the abdomen.'"